The Illinois Department of Transportation’s new multi-year construction plan seeks to assess the state's infrastructure across all modes of transportation. The proposal is for Fiscal Year 2013 through Fiscal Year 2018, and it considers not only roads and bridges but airports and rail routes, including transit and freight rail. “It provides more balance and growth to an already vibrant transportation network in Illinois,” said Illinois Transportation Secretary Ann Schneider. The plan calls for $9.2 billion in spending. The last of the capital bill funding, $1.2 billion would be pooled with $6.5 billion in federal funding, $2.2 billion in state funds and $454 million in local funds to pay for the program. In FY 2013, $1.8 billion would be spent. The plan calls for work to 2,302 miles of roads and replacement or repairs to 508 bridges. According to IDOT, the construction plant would create or sustain 120,000 jobs between FY 2013 and FY 2018. IDOT's plan also focuses on sustainability and information technology. Under the plan, 1,000 miles of fiber optic cables would be installed and upgraded along state and local highways. According to the proposal, IDOT worked to install 3,100 miles of fiber optic cable between 2010 and 2012. Go to IDOT's website to see a map of projects planned across the state. A lawmaker who entered a plea of not guilty today on bribery charges also plans to appear before a legislative committee charged with deciding whether he will face disciplinary action. A House Special Investigative committee decided last week to ask Rep. Derrick Smith to appear and testify under oath. The vote came after U.S. Attorney Patrick Fitzgerald told the committee that he would not share information from his investigation of Smith and asked that members not try to obtain such information. Smith is accused of taking a $7,000 bribe in exchange for writing a letter of recommendation for a day care center he believed was seeking a grant. Smith, a Chicago Democrat, was the subject of a federal sting, so the day care center was not actually seeking the grant. Smith could opt not to testify by evoking his Fifth Amendment rights, but Rep. Elaine Nekrtiz, chair of the committee, said that the group could take such a move under consideration when deciding whether there is reason to pursue disciplinary action against Smith. If the committee decides action is warranted the full House could vote to censure or even expel Smith. Nekritz, a Northbrook Democrat, said she expects the committee’s next hearing to take place this week or next week. Henderson said he did not know when Smith would be scheduled to appear. “When it happens, he will be there." As lawmakers look to cut the state budget, law enforcement officials warn that reductions to early childhood programs are false savings because they create a need for more spending in other areas. A measure to regulate a drilling process commonly referred to as “fracking” passed in the Senate with no opposition today. Hydraulic fracturing, also known as fracking, is a process used to extract oil and gas by pumping water, chemicals and sand into the ground. The water fractures a source rock, allowing gas or oil to escape and be collected. Sand is used to hold the cracks in the rock open. Chemicals are added to the water for a variety of reasons, such as disinfection, lubrication and making the water thicker to keep the sand from sinking. The primary controversy over fracking has been issues of water pollution. In Dimock, Pa, residents near fracking sites say their water has been contaminated and has made them sick. Preliminary tests by the U.S. Environmental Protection Agency did find some chemicals in residents’ drinking water but did not find any at levels unsafe for human consumption and could not positively link any contaminants to fracking. Residents in other states near fracking sites have had similar complaints, but the EPA has yet to produce a conclusive link between fracking and toxic water pollution. Proponents of fracking claim that the water is pumped into the ground far below drinking water reservoirs and cannot come in contact with drinking water. Surface spills of water used in the process are also a concern. Pennsylvania officials say that some methane released during the drilling of fracking wells did migrate to private water wells near Dimock. Methane is not toxic, but it does present a safety hazard because it is highly combustible. Multiple studies conducted by local governments have found elevated levels of air pollution near fracking wells. Franking has been practiced on oil wells in Illinois for decades, but a new interest has grown around the potential for extracting natural gas in southern Illinois. Such fracking projects would likely be on a much larger scale than anything Illinois has seen to date. Sen. John Jones, a sponsor of Senate Bill 3280 who has worked in the oil industry, said that he has participated in the fracking more than 500 oil wells over the last 30 years. Jones, a Mt. Vernon Republican, noted that there has never been a fracking accident in Illinois. The legislation would require drillers to met certain standards for protective casing built into fracking wells. They would also have to disclose the chemicals they use. Companies would be required to tell the state Department of Natural Resources how much water they use and how they plan to dispose of fracking waste water. The bill is backed by the industry, as well as environmental groups such as the Sierra Club. “This is the product of several months of negotiations,” said Champaign Democrat Sen. Michael Frerichs, a sponsor of SB 3280. Frerichs and Jones were the only two speakers during a floor debate of the bill today. Terri Treacy, a conservation field representative for the Illinois chapter of the Sierra Club, said that chemical disclosure would give residents living near fracking wells a chance at recourse if their water became contaminated. She said her group did not push for a ban on fracking because it did not seem like a political reality. “Bluntly, we feel like legislation to make it safer at this stage is more likely than getting a ban,” she said. The National Farmers Union in Canada has called for a moratorium on fracking in Canada. Several New York municipalities have banned the practice, and New York State is considering a moratorium. “The environmental groups that we have dealt with are not antidevelopment groups,” said Brad Richards, executive vice president of the Illinois Oil & Gas Association. “They just want to make sure that the ground water is protected.” Richards said that fracking has been done responsibly in the state for decades, and the industry as a whole has embraced disclosing the chemicals used. But some in southern Illinois still hope to keep new fracking endeavors out of their area. Liz Patula, coordinator of Southern Illinoisans Against Fracturing Our Environment (SAFE), said that the potential risks of fracking are too big to consider for an uncertain economic payoff. She said she is worried about the long term impact if water or land becomes polluted during the process. “You’re talking about a few jobs, and the price for that is literally destroying the region and the land base.” Patula’s group is reaching out to farmers in southern Illinois and trying to rally a grassroots opposition to fracking. Drilling is expected to begin in the next few months. For a comprehensive look at hydraulic fracturing and what it could mean for Illinois, see the upcoming May edition of Illinois Issues. A committee tasked with determining whether there is cause to discipline a lawmaker accused of bribery has hit a wall in terms of evidence that is available for its investigation. Rep. Derrick Smith, a Chicago Democrat, was arrested on bribery charges in March. Prosecutors allege that Smith accepted a $7,000 bribe for recommending a day care for a construction grant. Smith was the subject of a federal sting, so the day care was not actually seeking the grant. Smith has since been indicted on a bribery charge. The indictment said that $4,500 of the alleged bribe money has not been recovered. A House Special Investigation Committee voted today to request Smith to testify before the panel under oath. The committee must decide whether the House should pursue disciplinary action against Smith. The move came after United States Attorney Patrick Fitzgerald told the committee that his office would not share evidence with the committee. Fitzgerald said the committee cannot seek information through subpoena or requests under the Freedom of Information Act without potentially causing harm to criminal investigations. “I can tell you that our investigation of Representative Smith is continuing, and it is our strongly held belief that any disclosure of the government’s evidence or active inquiry conducted by the committee into the allegations of the federal indictment will likely interfere with our pending case and ongoing investigations,” a letter from Fitzgerald to the committee stated. Nekritz said one option left to the group would be to go directly to Smith. The committee opted to send Smith a letter requesting his testimony instead of issuing a subpoena, but Nekritz said that either option would have the same result. Even if subpoenaed, Smith could opt not to testify based on his Fifth Amendment rights, which protect against self-incrimination. However, Nekritz said that if Smith decides not to testify, the committee could take that into consideration when deciding if there is enough evidence to seek a disciplinary action against him. In criminal court, if a defendant invokes Fifth Amendment rights, it cannot be used against him or her. Smith did not appear at today’s hearing or any of the previous meetings of the committee. He has returned to work in Springfield, but he has declined to answer questions from the press. A call to his lawyer was not returned. Nekritz said Smith is expected to enter a plea next week, and the committee wants to see if any new information or documents come out of the court proceedings. “I think it behooves us as we go through this to get as much evidence as we can," Nekritz said. She said the committee does not have to wait until the end of criminal proceedings to make a recommendation to the House, but for now, she would like to wait and see if the committee can get more to go on in the coming weeks. If the committee recommends disciplinary action, the full House could vote to censure or expel Smith. “In the short run, we would like to see what could become available through the court filings and what the U.S. attorney does through the [evidence] discovery process,’ Nekritz said. “Unfortunately, I have a very short-term view of this now, and it’s very hard to predict months out how that’s all going to play out because it could dramatically change next week.” She said she expects the group to hold another hearing in the next two weeks. Advocacy groups have begun their push back against Gov. Quinn’s proposed Medicaid cuts. A new report released by the Campaign for Better Health Care and Families USA — both nonprofit health care advocacy organizations — claims that the proposed cuts by Quinn would not only hurt some of Illinois’ most vulnerable citizens, but the cuts would also have a drastic impact on the state’s economy. “If Medicaid is cut, it would not lessen the number of people who will be needing health care, and it would not lessen the number of people who will be utilizing health care,” said Jim Duffett, executive director the Campaign for Better Health Care. Last week, Quinn proposed a plan to defer $2.7 billion in Medicaid growth. His proposal would cut $1.35 billion by eliminating or reducing services and finding efficiencies. Health care providers would also take a $675 million hit in rate reductions for the services they provide under the program. The report found that an 18 percent cut, the total reduction in Medicaid spending the group says Quinn is proposing, would put more than 25,000 jobs at risk. The group said Quinn’s proposal would also result in $3.2 billion lost in business activity statewide. “These are real people, real jobs, real patients, real communities that are tremendously facing harm. The cuts of the magnitude that are being proposed, we estimate roughly an 8 percent across the board [to providers], is really just way too far, what we are trying to do in filling up a $2.7 billion spending gap is unprecedented in its size and scale, and we really need to appreciate the type of impact that level of cuts is going to have, not only on the economy but on real people,” Maryjane Wurth, president & CEO of the Illinois Hospital Association, said at a news conference highlighting the report. Instead of proposed cuts, such as the elimination of adult dental care and Illinois Care Rx, a prescription drug program that helps low-income seniors pay for their medicine, the groups advocate expanding coordinated care in the Medicaid program to improve access. The groups also support the idea of creating more programs that could possibly get matching dollars from the federal government. “Hospitals are working very hard on moving to integrated care, care coordination, so that people get the right care at the right time with the right outcomes with the lowest cost. We should be investing — we need to be maximizing federal revenue to the state. Right now, for every dollar that is cut in Medicaid, we simply hand back a dollar to the federal government. This is a time when, in the Illinois challenge, that we should be maximizing every single legitimate dollar that this state can achieve,” said Wurth. But Quinn believes the cuts are necessary for the state to catch up on its backlog of Medicaid bills. Quinn said the growing stack of unpaid Medicaid bills — which he says would reach $4.6 billion by the end of Fiscal Year 2013 if no action is taken — makes reductions in the program necessary. He said those in opposition to his proposals are ignoring that reality. “We have to save the system in order to have a system. It is on the verge of collapse,” Quinn told the editorial board of the Springfield State Journal-Register today. Quinn said he is open to negotiating Medicaid changes as long as they would result in a $2.7 billion reduction in liability for next fiscal year. But the one thing Quinn and many advocates agree on is a $1-a-pack cigarette tax increase to avoid some cuts. Quinn estimates the proposed increase would bring in $337.5 million, plus another $337.5 million in federal matching funds. “We didn’t get into this hole overnight. It took years to get here; it will take more than one year to get out. By considering such common sense revenue solutions, for example, such as a cigarette tax, we would be well on our way on beginning to raise the revenue that is needed to go against these cuts,” said William McNary, co-director of the Citizen Action Illinois, an advocacy group that joined social services organizations to protest Quinn’s proposal at the Statehouse today. However, Republicans have come out hard against the cigarette tax plan. Quinn said he would work to lobby lawmakers on the idea. Under a plan Gov. Pat Quinn laid out today to reform the state pension system, workers would have to choose between retiring later and paying more for benefits or giving up state subsidized retiree health care coverage and not having any future pay increases figured into their pension benefits. While Quinn acknowledged that the primary cause of the state’s $83 billion pension liability was governors and lawmakers failing to make the needed contributions in the past, he said today that benefits must be scaled back to ensure the future integrity of the state’s retirement systems. “I know I was put on Earth to get this done,” Quinn said at a Chicago news conference. Under Quinn’s plan, employees of state government; public colleges, universities and local schools; and legislators would have to pay 3 percent more of their salaries into the pension systems. They also would not be eligible for full retirement benefits until age 67. Currently, contribution levels and retirement ages vary from system to system. Under Quinn’s plan, teachers would go from paying 9.4 percent of their salaries to 12.4 percent. University workers would see their contributions rise from 8 percent of their salary to 11 percent. Currently, many state employees can retire at age 60, but the number of years spent on the job also goes into determining retirement age and level of benefits. Quinn said the change in retirement age would be phased in but did not give details on how that would work. Quinn's plan would not affect judges, who also belong to a state retirement system, or currently retired state employees, according to Brooke Anderson, a spokeswoman for the governor. Cost of living increases for future retirees also would be reduced. Retirees now receive an annual compounded 3 percent cost of living increase. Quinn’s plan calls for future retirees to get an annual increase of 3 percent or half of the federal Consumer Price Index, whichever is less. The cost of living increase also would not be compounded over time and would not kick in until a retiree reaches 67 or has been retired for five years, whichever comes first. Anderson said current retirees would not be affected by Quinn's proposed changes to the cost of living increases. Quinn also said he supports shifting some costs to local school districts and state community colleges and universities, but he said that component of the plan is still a work in progress. “I think that this is a principle of accountability that everybody understands that those that are negotiating [employee contracts] should have skin in the game,” Quinn said. He said his proposal would produce $65 billion to $85 billion in savings, not including savings produced by shifting some pension costs to local schools and state universities and colleges. He also said that by 2042, the state would commit to 100 percent funding for the pension systems, eliminating its current $83 billion pension liability. The target under current statute is for the pension systems to be 90 percent funded by 2045, meaning that they would have about 90 percent of the money needed to pay the projected future benefits of all employees in the systems. According to the United State Government Accountability Office, funding levels of 80 percent or more are considered “sound” for government pensions. The state pension systems overall are now about 43 percent funded. The funding formula, including a requirement that the state must fund the systems in the future, would be enacted into state law, Quinn said. Quinn added, “The other thing that employees will have is the assurance that the state will make the payments over the next 30 years.” He said he expects about two thirds of employees to opt for the benefit reductions over losing health care coverage. Teachers unions argue that such reductions would hurt recruitment efforts and deter people from entering the profession. “Today, Gov. Quinn announced a proposal to address the Illinois pension problem that will adversely impact many active [Illinois Education Association] members and make education a less attractive career,” said a written statement by the Illinois Education Association. Education officials have argued that keeping teachers working longer would cost the state more than $1 billion because senior teachers earn higher salaries than newer teachers. Cross said he want to make sure that any plan that is signed into law would have the best chance of surviving an inevitable court challenge. “I think at the end of the day, regardless of what we do, it’s going to end up in court," he said. After a group of legislators failed to agree on a plan to reduce Medicaid costs, Gov. Pat Quinn released his own proposal today. Quinn’s plan to defer $2.7 billion in Medicaid growth calls for $1.35 billion in savings and a $675 million rate cut to health care providers. He is also proposing a $1-dollar-a-pack cigarette tax increase, which he says would bring in $337.5 million. If spent on Medicaid costs, that money would result in a $337.5 million match in federal funds. In an effort to help mend the “broken” system, Quinn pitched a plan with more than 50 individual proposals, including services that could be reduced or terminated. The proposed plan emphasizes changes to utilization controls, which would limit how many times a patient could use a certain service or cap the cost of treatment he or she could receive. Limiting eyeglasses to one pair every two years. Limiting prescriptions to five per month for adults and children. Limiting diapers for adults and children to 200 a month. The current limit is 300. Capping coverage for physical therapy, occupational therapy, speech, language and hearing therapy. Under Quinn’s recommendations, patients would be charged a $10 copay for going to the emergency room for nonemergency treatment. A $3 copay would be required for generic drugs. Currently, copays are only charged for brand name prescription drugs. The proposal also includes 10 percent cuts to hospice care, home health and medical equipment. Some so-called optional services would be eliminated. Adult dental care and the Illinois Care RX, which is a prescription drug program that helps low-income seniors pay for their medicine, are on the chopping block to be terminated. Both cuts are controversial, and if Quinn gets his way, approximately 180,000 seniors would be affected by the loss of the Illinois Care RX program. Adult dental care would affect 172,000 Illinoisans. Some experts believe eliminating services such as dental care can push costs to other, more costly areas of the budget. Quinn is also calling for the elimination of group therapy in nursing homes, podiatry services for patients who do not have diabetes and chiropractic care for adults. The push to reduce Medicaid costs comes in wake of Quinn’s “rendezvous with reality” budget address in February, when he told lawmakers they could not go home until they pass comprehensive Medicaid reform and called on a Medicaid working group to help solve a $2.7 billion crisis — an amount Quinn says would carry over into 2014 if lawmakers do not act now. “We just can’t afford to [put off paying bills]. The system would implode, and it would eat up everything in state government,” Quinn said in a news conference. He cited recent Civic Federation projections that Medicaid spending could reach $21 billion in unpaid bills by 2017. But rate cuts for health care providers and the proposed cigarette tax increase were nonstarters with Republican members of the Medicaid working group. But Quinn said Medicaid patients should not be asked to bear all the pain of cuts. “We have to ask our providers, those who are involved in the health care system, to tighten their belts, and we are doing that by asking them to make economies of $675 million,” Quinn said. A cigarette tax increase has failed to pass in both chambers despite many recent attempts at reviving the idea. The Senate did approve an increase in 2009, but it was shot down in the House. But Quinn argued that the increase would bring in money and deter smoking, which would save future health care costs. Senate President John Cullerton has been a longtime backer of a cigarette tax increase. “It's good fiscal and health policy and it should be part of our Medicaid stabilization plan,” Rikeesha Phelon, a spokeswoman for Cullerton, said in a written statement. Righter challenged Quinn to put his plan into legislation to be called for floor votes as early as next week. “And then we’ll find out whether or not the working group’s work is done,’ Righter said. “I have not taken a poll of the members of the General Assembly, but I suspect the working group would go back to work.” For now, the legislative group plans to continue its work and has a meeting scheduled for Tuesday. Gov. Pat Quinn tasked two legislative groups to recommend fundamental changes to the state’s Medicaid and pension systems. Neither of those groups has produced a final plan, but the governor is pushing ahead with his own recommendations. But one thing that the governor and legislators on both sides seem to agree on is that the Medicaid liability must be drastically reduced to save the system from collapse. Gov. Pat Quinn also called for a legislative working group to put forth proposals for reforming the state’s public employee retirement system by the beginning of this week, but that group was unable to reach an agreement. Quinn is expected to unveil his own set of proposals tomorrow. “I think the governor is going to announce tomorrow what he thinks ought to be done,” said Sen. Bill Brady, a member of the group. Brady, a Bloomington Republican, said that he expects Quinn’s proposal to contain some recommendations the group agreed upon and some they did not. “It’s 24 hours away, but that’s sort of what we’re anticipating right now,” said Rep. Elaine Nekritz, who is representing House Democrats on the working group. The group was still holding meetings this afternoon. She said that the proposals were delayed not because negotiations met an impasse but because of the logistics of trying to tackle the two major issues of Medicaid and pension reform in just a few months. “I think the delay is more due to interactions with Medicaid and some of the other things going on,” she says. “I think it has less to do with pension stabilization and more to do with all the really big issues that are swirling around here,’ said Nekrtiz, a Northbrook Democrat. However, Brady said that the lack of a presence from public employee unions has slowed the process. “One of the biggest reasons is we’ve asked labor to come and discuss it with us,” Brady said. “They have not accepted our invitation.” Brady said the pension group also plans to continue its work and has a meeting scheduled for next week. Union officials say they have pulled out of the talks because they are unsure whether the working group is engaging in earnest negotiations. They are concerned that the members may not have the authority to speak for Quinn and the legislative leadership, so the bargaining may not be backed by a real ability to get whatever deal is reached approved by the full General Assembly. "Early in the process, we requested relevant data to analyze the impact of any proposal made by the working group. To this date, we have received no data. In addition, despite previous assurances that the working group was empowered to speak for the governor and all the legislative leaders, it is no longer clear that that is the case,” Michael Carrigan said in a written statement on behalf of the union coalition We Are One. “Our unions are firmly committed to negotiating a solution to the pension funding crisis. However, to go forward, we need both the data supporting any proposals and a commitment that the representatives with whom we engage are authorized to speak for the governor and the legislative leaders.” Carrigan said in the statement that the group met with legislators working on pension reform on three occasions but that he does not know what will be in their proposal. The Illinois House approved a measure today that would make it more difficult to increase pension benefits, but Republicans argue that the same threshold should be set for tax increases. There was no opposition in the House to a proposed constitutional amendment that would require that any increase in pension benefits for public workers to receive a three-fifths majority vote to pass. Currently, such increases require a simple majority. “There’s a lot of tough medicine in this resolution. I think the tough medicine is needed,” said House Speaker Michael Madigan, who sponsored HJRCA 49.Under the measure, an increase to salary or wages would not constitute a pension benefit increase, unless the raise was excessive. Madigan said that lawmakers could set the parameters for “excessive” pay increases. The amendment would up the required support to override a veto of a bill containing pension benefits to two thirds of each chamber. Currently, only a three-fifths majority is required to override a veto. It also calls for increased benefits for municipal public workers to be approved by a three-fifths majority of a local board or council. Union officials say that the state’s billions in unfunded pension liability was caused by lawmakers and governors opting to skip annual pension payments, not by increased benefits. “This change to the Constitution would not address the true crisis threatening Illinois public retirement systems, which is the habitual failure of politicians to adequately fund the modest pensions earned by public employees. We continue to believe that this funding crisis can only be solved by all parties working together in good faith, and our union remains committed to doing so,” said Anders Lindall, spokesman for the American Federation of State County and Municipal Employees Council 31. A recent report from the Commission on Government Forecasting and Accountability found that the bulk of the shortfall is a result of underfunding. Lindall also argued that the reduced pension benefits that went into effect last year do not meet federal requirements for employees, such as teachers, who will not receive Social Security benefits for the time they work for the state. “The lower pension tier forced on newly hired public employees must be fixed to avoid severe federal penalties. It is unwise to make such needed amendments more difficult to achieve,” Lindall said. Springfield Republican Rep. Raymond Poe said that the amendment should also protect against lawmakers voting to skip pension payments by setting the threshold to skip a payment at a three-fifths majority. “We also need a safeguard in there that you can’t short those payments in the future,” Poe said. The measure contains no such provision. The issue of guaranteeing future payments into the pension system will likely play into the ongoing negotiations over other pension reforms that may include reductions in benefits for workers hired before lower benefits for new employees went into effect last year. After Madigan’s amendment was approved, Republicans moved to have two constitutional amendments that are languishing in the rules committee called to the floor for a vote. The amendments would require the approval of a three-fifths majority to increase taxes in the state. “Let me commend Speaker [Madigan] for realizing that some votes in this chamber carry heavier consequences and deserve a little bit of extra scrutiny. He is right that decisions that have great impacts on the fiscal health of Illinois residents and the state as a whole should have to meet a higher standard and require a greater threshold,” said Arlington Heights Rep. David Harris, who is listed as a sponsor on both amendments. Harris argued that such a higher threshold should also apply to tax votes. “This is nothing significant or new. We already require a higher voting standard for borrowing, for laws that would preempt home rule and to overturn the governor’s veto. The next logical steep would be to require the very same threshold for bills that would make Illinois residents have to pay more taxes.” The Republicans’ efforts were blocked and the measures did not come up for a vote. If the Senate approves HJRCA 49, it would appear on the ballot in the November general election. To be included in the state’s Constitution, it would require the support of either three-fifths of those who choose to vote on the question or the majority of those voting in the election . As pension reform talks flounder in Illinois, a polarizing national figure drew union protests today in Springfield. Wisconsin Gov. 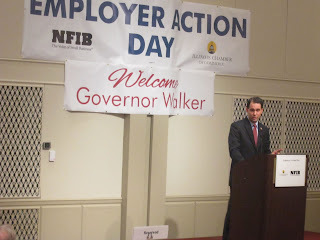 Scott Walker spoke to a gathering of business leaders today at their annual lobbying event in Springfield. Doug Whitley, president of the Illinois Chamber of Commerce, said the chamber’s decision to invite Walker was not meant to incite disagreement. Rather, the group wanted to contrast the ways that Wisconsin and Illinois have sought to address budget deficits. Whitley said Wisconsin avoided a tax increase and encouraged economic growth by implementing business friendly policies such as tax breaks and reducing regulation. He said Illinois lawmakers should be “conscious” of what is happening in neighboring states and concerned about keeping the state competitive. “There are economic consequences to bad public policies,” Whitley said. Walker, who is facing a recall election in June, gave what seemed much like an election stump speech, touting what he sees as accomplishments from his year in office. He cited the state’s balanced budget, which he says was achieved through fundamental reforms instead of slashing core services or increasing taxes. “I think at the time, there were a lot of people down here at the state Capitol who are proponents of these tax increases, who looked at what was happening last year in Wisconsin and kind of proudly said, 'Well, we’re not going to do what Wisconsin did. 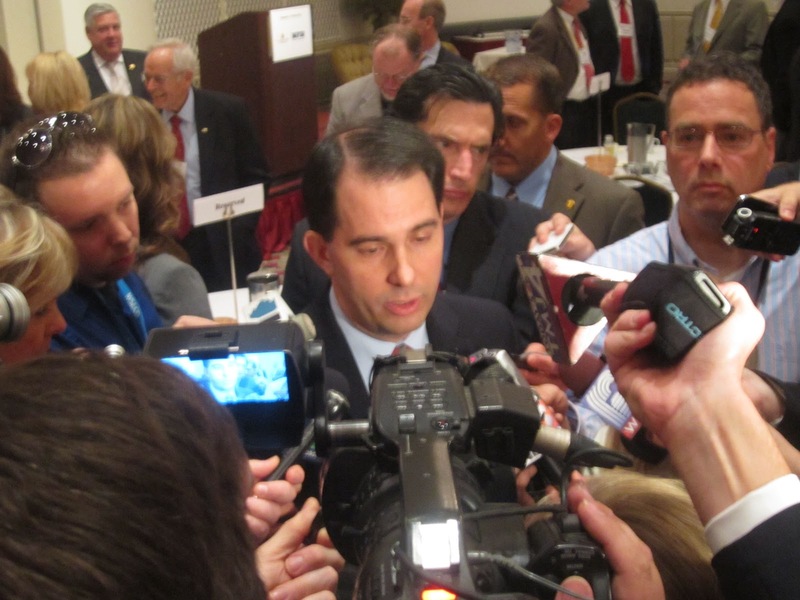 Well, clearly the state government in Illinois didn’t,” Walker said. “Obviously things haven’t gotten any better when it comes to the state budget down here.” Walker blamed his recall election on “union bosses” and national union organizations that see him as a threat to their power. He also cracked wise about his revival of an old tourism slogan, “Escape to Wisconsin,” which Walker brought back as an attempt to appeal to businesses after Illinois increased its income tax rate last year. While Walker drew a group of attendees to the event that was comparable to previous years, he also brought out a large crowd of union protesters upset with his policies. Anders Lindall, spokesman for the American Federation of State, County and Municipal Employees Council 31, said that inviting Walker to speak “shows for one thing how out of touch from regular people those corporate lobbyists and corporate chieftains really are.” Lindall said protesters who turned out today from multiple unions, including private sector affiliations, represent the hard-working core of the state’s middle class. Protester Cary Quick said: “Myself and many of my brothers and sisters that are union members came out to give Scott Walker an unwelcome to Illinois and ask him to go back … and take back all his union-busting, corporate bolstering political ideas to Wisconsin with him — to where he can await his soon-to-come unemployment and allow Wisconsin to get themselves back on track.” Quick said he plans to travel to Wisconsin in the coming months to campaign against Walker. Quick, who works as a mental health technician at the Choate Developmental Center in the southern Illinois city of Anna, says he came to Springfield to send a message to lawmakers that moves such as Walker’s attacks on public employee unions “would not be tolerated” in Illinois. Quick said he is worried about losing pension benefits, as well as Gov. Pat Quinn’s proposal to close several state facilities. While Choate is not on the list for potential closure, Quick said he is concerned that facility closures in the area would hurt his community. Union County, where Anna is located, had a 13.6 percent unemployment rate in February. Walker and Illinois public employee unions do agree on one thing: Both say that Quinn’s proposal to close several state facilities and layoff workers would be bad for Illinois’ economy. 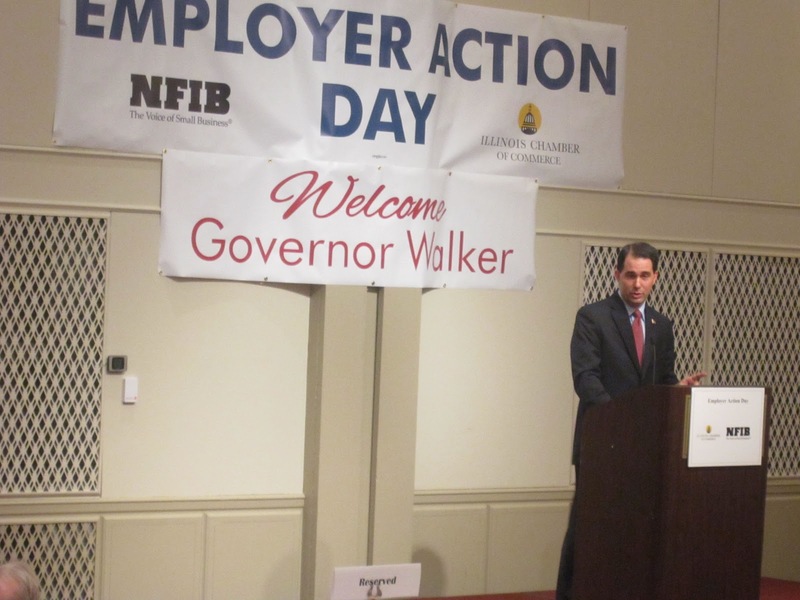 “All those things will have a negative impact on public employees in the state,” Walker said. But Quinn insists that the closures have to take place to balance the state’s budget. Quinn’s hopes of reforming the state’s underfunded public pension systems seem to be struggling, as public employee unions have announced that they are not negotiating with the legislative working group. Michael Carrigan, Illinois AFL-CIO president, said the unions are asking for data that they have not been given, as well as assurances that the lawmakers in the group can negotiate on behalf of Quinn and the four legislative leaders. “Our unions are firmly committed to negotiating a solution to the pension funding crisis. However, to go forward, we need both the data supporting any proposals and a commitment that the representatives with whom we engage are authorized to speak for the governor and the legislative leaders,” Carrigan said in a written statement from the We Are One Coalition, which represents several unions in the state. Quinn had set today as the deadline for the pension working group to present its ideas, but Brooke Anderson, a Quinn spokeswoman, said the group, as well as another working group that plans to propose Medicaid cuts, asked for more time. She said both sets of recommendations should be presented by the end of the week. “You should not worry about holding your breath too long because it will be very shortly,” Quinn told reporters in Chicago today. A state panel of education experts has released a set of recommendations that does not include forced consolidation of districts — a move that Gov. Quinn has advocated for. The Classrooms First Commission, a panel that, along with education experts, includes lawmakers from both parties, released recommendations that favor “voluntary” consolidation and shared services between schools. According to the report its suggestions could save the state up to $1 billion. The recommendations come after Gov. Pat Quinn proposed consolidating many of the state’s school districts to save money. The group, known as the Classrooms First Commission, found that under current law, a move to consolidate Illinois’100 high-school-only districts with 377 elementary-only districts into 101 districts could cost the state nearly $4 billion. The $4 billion price tag comes from incentives the state must pay when combining districts. However, Quinn originally believed the plan would save more than $100 million. The report found that a more cost effective approach would be to eliminate or modify some state laws that discourage school districts from voluntarily consolidation. According to the report, at least 40 school districts were considering this option. “Forcing districts to merge is not realistic, but providing them the resources and tools to consolidate on a voluntary or virtual basis is well within reach,” state Rep. Linda Chapa LaVia, a member of the Classrooms First Commission said in a prepared statement. “We already have in Illinois 12 countywide school districts for the smallest counties, and I don’t want to tell those school districts to consolidate even more, I want those school districts to have the opportunity to work with neighboring school districts to share an advanced biology professor, to share a contract on purchasing textbooks, so that even though we're not asking them to consolidate, we're encouraging them to get the benefits,” said Simon. The draft report recommends a variety of changes such as: phasing in lower tax rates for new unit districts, piloting a new capital project list that targets school construction money at districts willing to consolidate and requiring counties with declining school-age populations to determine whether a countywide consolidation or sharing services would help struggling schools perform better. Although for some schools, the idea of consolidation seems inevitable, Simon has acknowledge concerns that schools worry about losing identity and local control under consolidation. “We held hearings across the state, and we definitely heard a lot of folks who talked about the importance of local control of schools. And what this set of draft recommendations does, it says we recognize that, we recognize the value of local control, but we also want to make sure that having a small locally controlled school district doesn’t mean you’re missing out on a higher level math course, or you’re missing out on the savings that can come from working together with another school district,” said Simon. • April 19th at Parkland College in Champaign. • April 20th at Southern Illinois University in Carbondale. • April 26th at Prairie State College in Chicago Heights. • April 30th at Rock Valley College in Rockford. The final report is scheduled to be completed by July 1, when it will be submitted to Quinn and the General Assembly. The number of autism cases is on the rise, but funding for autism-related programs in the state has been dropping and could take another hit under the budget for next fiscal year. Experts believe that improved diagnostic methods and increased awareness of the disease has contributed to the increase. “Some of the increase is due to the way children are identified, diagnosed and served in their local communities, although exactly how much is due to these factors in unknown,” the report from the CDC said. Minority children saw the largest increases. Between 2002 and 2008, The number of African-American children diagnosed with autism increased by 91 percent, and the number of Hispanic children diagnosed increased by 110 percent. Caucasian children saw a 70 percent increase over the same time frame. “We suspect that some of this increase is due to greater awareness and better identification among these [minority] groups. However, this finding explains only part of the increase over time, as more children are being identified in all groups,” the study from the CDC said. Although an autism diagnoses does not include tangible medical evidence such as blood test, it requires an observational test performed by a doctor who studies a child’s interaction. This can make it more difficult to diagnose than some other conditions. The CDC recommends if a parent notices some behavioral problems by the child’s first birthday, a screening maybe necessary. Autism is almost five times more likely in boys than in girls. In fiscal year 2012, The Autism Program of Illinois received $4.6 million. Under Gov. Pat Quinn’s proposed budget for FY2012, the group would get $4.1 million. However, lawmakers are on course to pass even bigger cuts than Quinn called for, so the final funding level could be less. Schmidt said that the cuts would lead to less services being offered to families who have children with from autism. He said the cuts would also make it harder to keep staff numbers up and make sure that employees are properly trained. The cuts could also lead to fewer hours of direct treatment for patients with autism. According to Schmidt, the cuts would result in 1,800 children not receiving some of the services offered by TAP, such as speech therapy, group support and early intervention for families. However, the Illinois Department of Human Services says the cuts are necessary to help the state regain control of its finances. “These are serious fiscal times, and tough cuts were made across all agencies. In order to move Illinois forward, we must reform and stabilize its Medicaid and pension systems ASAP. If we don’t tackle the task this spring, budget cuts will be much deeper and even more painful for programs and providers alike in FY 13,” Januari Smith, a spokeswoman for the Department of Human Services, said in a written statement. As the housing crisis continues to ravage many neighborhoods in the state, a study released today has identified a new breed of foreclosure that is on the rise. The report found that conventional mortgages given by banks represent a growing percentage of new foreclosures in the Chicago and Cook County area. It also reported that nearly a quarter of new foreclosure filings in 2011 were on loans that originated before 2005. That indicates the foreclosure crisis has now hit homeowners who had been able to afford their monthly payments for six years or more. In the past when borrowers lost their homes, experts pointed to subprime mortgages, which were marked by fluctuating interest rates and balloon payments. But the Chicago-based Woodstock Institute's report found that residents in the Chicago area are defaulting on more traditional loans, as well. “These new data show that even those buyers who took the less risky route of buying a home with a conventional mortgage are not immune from the impacts of the foreclosure crisis,” Spencer Cowan, vice president of the institute, said on the organization’s website. Cowan said the trend may have been brought on by the high employment rate. “People’s incomes have dropped; that’s why they cannot afford a mortgage anymore,” he said on a conference call today. The report also found the number of foreclosures in the Chicago region has declined, reaching about the same level as in the second half of 2008. There were 30,943 foreclosure filings in the six-county Chicago region during the second half of 2011, compared with 40,775 for the second half of 2010, a decrease of 24.1 percent. For the full year, foreclosure filings decreased by 18.9 percent, from 76,986 in 2010 to 64,877 in 2011. Although the number of foreclosures has dropped, Cowan believes the reductions may be a product of recent delays in the clogged foreclosure system. (For more on the overburdened foreclosure system, see Illinois Issues March 2011.) In 2011, there were almost 31,000 foreclosure filings but only 11,766 auctions in the six-county region, which suggests that the backlog in the courts may have increased. “Without concerted effort to address the forces that drive foreclosure activity, such as negative equity and unemployment, foreclosures will continue to drain wealth from all corners of our society,” Cowan said. If you do your reading on a Kindle, iPad, NOOK or other electronic reading device, state and federal officials say you could be getting gouged when you buy best-selling books. Illinois joined 14 other states and Puerto Rico to sue Apple and book publishers Penguin Group, Macmillan and Simon & Schuster over allegations of price fixing and violating anti-trust laws. “By colluding to fix the price of e-books, publishers and Apple essentially forced consumers to pay millions more for e-books than they otherwise would have paid,” Illinois Attorney General Lisa Madigan said in a written statement. “Enforcing the state’s antitrust laws will ensure that consumers receive the full benefit of competitive pricing and choice in the marketplace.” Madigan is seeking refunds for Illinois customers who were overcharged under the scheme. The U.S. Department of Justice is also suing Apple and book publishers Hachette, HarperCollins, Macmillan, Penguin and Simon & Schuster. The lawsuit alleges that the publishers and Apple colluded to prevent a drop in the costs of electronic books as competition grew. The DOJ and Madigan say that before Apple entered the marketplace in 2010, most bestsellers were $9.99, but after the company entered into agreements with publishers to raise the prices, the price tags went up to $12.99 and $14.99, and Apple received a 30 percent commission on the sales. Publishers then demanded the same prices from other booksellers. “Based on the commitments to Apple, the publishers imposed agency terms, over some objections, on all other e-book retailers,” said a written statement from the Justice Department. Some publishers have argued that their agreements with Apple prevent Amazon.com from holding a monopoly over the e-book marketplace. Hachette, HarperCollins and Simon & Schuster agreed to settle with the Department of Justice. Under the terms of the settlement, they must end their agreements with Apple and allow retailers to sell their e-books at discounted prices. Amazon said in a written statement that as a result of the settlement, it plans to drop the cost of some of the e-books it sells. The state’s safety net hospitals say Illinois should crack down on Medicaid eligibility instead of cutting rates paid to health care providers or services to those who truly need the program. Newton said his workers also see indications of potential fraud. He said patients with pacemakers come in with their pacemaker registered under one name and their Medicaid coverage under another name. “Now how does that happen?” he asked. Newton joined a group of the so-called safety net hospitals, which are located in low-income and medically underserved areas of the state, that put forth a list of suggestions as the state looks to cut $2.7 billion in Medicaid growth. Administrators of hospitals in the association say that without the care they provide, many Illinoisans would find themselves in health care deserts with no other options nearby. Many of the hospitals are also the largest employer in the areas they serve. One of the key components of the proposal from the Illinois Association of Safety-Net Hospitals is tightening they way the state checks eligibility. The group estimates that100,000 to 300,000 patients currently on the Medicaid rolls earn too much to qualify for the program and that $400 million to $1.2 billion could be saved if Illinois took more steps to ensure that all who are receiving Medicaid benefits actually qualify for them. “The system is not being administered effectively to put those dollars where they’re going to have the most impact,” Newton said. But the state has already hit roadblocks on efforts to determine eligibility. It took a year for the federal government to approve a plan to check state records to ensure that applicants are residents of the state. The feds have yet to make a decision about another provision that would require applicants to regularly provide proof of income. The association also says Illinois should capture more federal matching dollars and determine if some patients or services may be covered by alternative options, such as the federal Medicare program. The plan also calls for charging a $10 copay to patients who go to the emergency room for nonemergency care. A federal waiver would be required for such a move. Overall, the group says the proposal could save about $1.4 billion. The hospitals are calling on lawmakers to consider the proposal before cutting provider rates or care to patients. Administrators from the safety net hospitals said that reductions to provider rates and services covered by Medicaid could leave the already fragile institutions “near or at complete breakdown.” Dennis Ryan, vice president of external affairs at the Holy Cross Hospital, said his institution on the south side of Chicago already came “perilously close to closure” four years ago. “Lives and well beings can be at stake, and undue cost cutting risks are both unethical and immoral,” Ryan said. “You cannot fly an airplane without a wing.” Providers said that the looming $2.7 billion in cuts is already affecting their operations by making it difficult to borrow money to cover budget shortfalls. “A number of banks are now telling us that they will not extend letters of credit because Illinois is not the place that they want to do business,” Newton said. According to a state audit released today, the state’s Firearm Owner Identification system is flawed and may be a risk to public safety. Auditor General William Holland found that the vast majority of counties are not submitting court orders to the state that would disqualify card holders from gun ownership. “The effectiveness of the Illinois FOID card program operated by the [Illinois State Police] is limited in promoting and protecting the safety of the public. There are significant deficiencies in the reporting of individuals with potentially disqualifying mental health conditions to the Illinois State Police. Consequently, in most counties, if the court finds individuals to be a “mental defective” or “intellectually disabled” (terms used by the Act), ISP is not receiving the information needed from the circuit court clerks to revoke or deny FOID cards for individuals from those counties. Unless reported by another source (such as a state-operated mental health facility, hospital, etc. ), individuals from those counties could receive or continue to hold a valid FOID card and could use it to purchase firearms and ammunition,” the audit said. According to the state police, there were 1,316,508 individuals with active FOID cards in Illinois as of January 2011. The Illinois State Police’s Firearms Services Bureau received 903,139 FOID applications from 2008 to 2010. Of those, 879,906 were approved and 20,152 were denied. Auditors found that only three of the state’s 102 circuit clerks had submitted mental health rulings to the state, and the court orders that were submitted were lacking important information, such as the ages and genders of subjects. Bond said the Illinois Department of State Police is backing House Bill 4456, which would clarify the clerk’s role in the process and require them to submit such rulings with or without direct orders from a judge. The audit found other problems with the system beyond the lack of mental health records. Thousands of cards were not being delivered to applicants. The State Police told auditors that many of these cards were returned by the post office as undeliverable. Auditors estimated that 6,200 cards had come back to the State Police. The department did not have enough people to answer phone calls related to the FOID program. During the last quarter of 2010, 85 percent of calls went unanswered. “On some days during peak times, more than 1,000 calls per day are received. Like government agencies across the country, we are doing more with less and are in the process of looking at ways to manage these expectations. If an employee calls in sick, in order to maintain a steady flow in processing applications, we have to rely on the employees that are available, resulting in overtime,” Bond said. She said that the department is considering a more automated phone system. The state police also spent hundreds of thousands of dollars on overtime costs associated with processing FOID applications. Between July 1, 2009, and June 30, 2011, the state police spent $526,919 on overtime for the FOID program. Almost $240,000 of that went to three employees. Supporters of expanding gambling in Illinois plan to push a revamped gaming bill when lawmakers return to session later this month. A gaming bill passed both chambers last year, but Gov. Pat Quinn said he would not sign it as is, so lawmakers held it from ever going to his desk. The measure would have allowed for five new casinos, including one owned by the city of Chicago, and slot machines at horse racing tracks. Sen. Terry Link, a Waukegan Democrat, said at the time that the changes Quinn wanted, which included taking out the slots at horse racing tracks, would never gain the support needed to pass. Quinn was, however, a vocal supporter of a Chicago casino. Those in the horse racing industry would still like to see slots at tracks. “I am always open, as I want a gaming bill, and I want everybody to come together,” said Tony Somone, executive director of the Illinois Harness Horsemen’s Association. “I’m hopeful that Gov. Quinn will see why the bill will be necessary to help the horse racing industry. I’m hopeful. I’m cautiously optimistic.” Somone said he does not know the details of Link’s new bill. Quinn’s office is in on negotiations, but publicly, the governor is sticking by the scaled-back plan that he proposed last year, the one that Link said couldn’t pass. “Governor Quinn continues to be open to a smaller, more moderate expansion that prevents corruption and provides adequate revenue for education. He laid out a strong framework last October outlining those standards,” Brooke Anderson, a spokeswoman for Quinn, said in a written statement.